The Doha climate conference stretched beyond deadline but ended in what can best be described a nail-biting finish. This was the 18th conference of parties (COP) to the climate convention, which meets once a year to push for action to cut greenhouse gas emissions, which are so intertwined with economic growth that the world has been haggling for the past 20 years over who will reduce and how much. The fact is that during these 20 years the science of climate change has become more certain. The world is beginning to witness what the future will look like. More extreme weather events like tropical storm Sandy are expected to cripple life and livelihoods across the world. The ocean nation of the Philippines has seen 17 killer typhoons in the past year. But even as science has become more certain, action has become more uncertain. The Doha package is full of mere words. The second commitment period of the Kyoto Protocol has been agreed upon, but with weak targets and loopholes. The US has not put any meaningful emissions reduction on the table. The financial package, essential for adaptation measures by the most vulnerable countries, is a broken promise. The important achievement at Doha was that the world did not dismantle the principles that will govern its efforts to cut emissions. These principles, after bitterest of bitter fights, have been retained and strengthened. The outcome of the conference states efforts of parties will be taken on the “basis of equity and common but differentiated responsibilities and respective capabilities”. For the US the issue of equity in the allocation of responsibility and action based on contribution to the problem has been like a red rag to a bull. The US delegation has made clear its extreme aversion to any mention of the words equity and historical emissions. At the Copenhagen COP 2009, bowing to US pressure, these words had been erased from the draft decision. In the negotiations of the Durban Platform (ADP), which will now work to build the agreement for emission reductions post-2020, the word “equity” has not been used for this reason. Instead, it has been agreed that action will be “under the climate convention”, which in turn is embedded within the framework of equity. It is no surprise then that the US made its reservation and right to future rejection known on these two references. In the final plenary, US climate czar Todd Stern categorically said his government would “revoke all attempts to invoke” these principles. This will make the road to meeting climate change challenge bumpy. Doha also agreed, importantly, to include the principle of “loss and damage”— estimating the economic and livelihood cost of the impacts of climate change that the most vulnerable countries will have to bear. This is crucial as the runaway extreme weather events are devastating economies. It is also agreed that there are linkages between extreme events and slow-onset events—the variable rains that lead to droughts, for instance. This was the key demand of island nations and the least developed countries. They wanted a mechanism to estimate and compensate for these damages. After much resistance, again from the US, it has been agreed that the world will decide on this mechanism by COP 19 to be held in Poland next year. But in the final assessment, at Doha, the world agreed not to raise its level of ambition high enough to meet the gigatonne and financial gap. It had been agreed at the Bali conference held five years ago that the already industrialised world needed to cut emissions to 45 per cent below the 1990 levels by 2020 to keep temperature increase within safe limits. It was agreed that this would be done by Kyoto Protocol parties increasing their levels of ambition and by non-Kyoto Protocol parties, mainly the US, by cutting emissions at “comparable” levels. The Kyoto Protocol was given its second commitment period. In other words there is a continuation of a multilateral and rule-based regime to reduce emissions. But the targets set by its party countries are weak and meaningless. The agreement has also been weakened by the fact that huge amounts of emissions are available to countries like Russia to trade and sell in this commitment period because their economies collapsed after the agreement. These assigned amount units were at the heart of the bitterest fight at Doha as Russia, Belarus and Ukraine struggled to keep these emissions free for trade. The European Union and other Kyoto Protocol parties pledged that they would not buy these “hot air” emissions. In addition, the US, which was to cut “comparable” levels of emissions, has agreed to reduce by only three per cent over the 1990 levels. 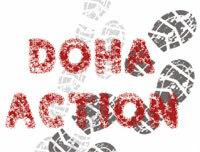 Doha has shown that large annual meetings, with thousands of people jetting to distant locations, are counter productive. Each country, region, city must take action, without waiting for the other ones to act. In 2011, the US had the lowest carbon emission since 1992, driven by a switch to natural gas and action by states and cities. Uhmmm.............everybody and anybody can lord over their country's achievements but 'how much is enough' to say 'This much is what i can achieve'. Firstly why is everyone (the nations) trying to score brownie points over others when in reality well off nations must help in measures which can translate to benefits like clean fuel technology and much more. In all global negotiations on environment and sustainable development, the biggest irritant is the term, "EQUITY". Developing nations want equal right to put toxins in to our global common resources. They insist on all per capita commitments ( to pollute or but not on "not to pollute" !!!!) must be based on Equity principle. I ask why not all nations commit themselves on the size of their economies. The size of the economy determines the level of pollution / toxins that we put into environment. As an economy grows, its commitment to environment must also grow proportionately. Otherwise, we will be rewarding the countries with larger populations to pollute more. Just as developing countries do not like to take responsibility for the size of their historical population, the developed countries also do not like to take responsibility for the historical emissions. Can the principle of Equity be used only while talking of "Rights" but not when we talk of "Responsibilities"? But if we discuss the commitments based on size of Economy, we can talk both on terms of "Rights" and "Responsibilities"